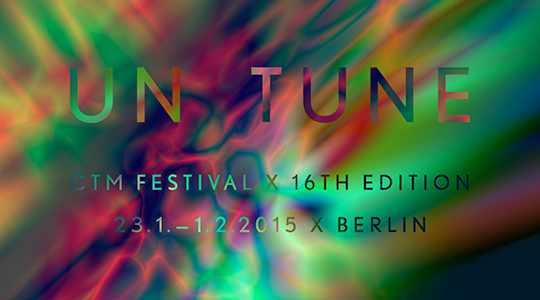 Through its Un Tune theme, CTM 2015 aims to engage with the direct bodily effects of frequencies, sound, and music as well as with their synergistic effects with other sensory stimuli. The festival will thus highlight, more than ever, the adventurous, exploratory side of music and art. Artistic experimentation with the affective and somatic effects of sounds and frequencies opens up possibilities of tuning and de-tuning the composite that interconnects body, matter, energy and (musical) machines – and of exploring our perception. The SHAPE project will launch at CTM 2015 with a Meet and Greet on Thursday 29 January at the Projektraum of the Kunstquartier Bethanien. All interested artists, professionals, and the general public are welcome to come meet SHAPE coordinators and musicians! Marco Donnarumma will perform at the Hacklab Opening at the Kunstquartier Bethanien / Projektraum on Friday 23 January, the first night of the festival. His performance will feature his own Xth Sense instrument, a special technology in which his own varying muscle contractions, heart rate, and other electrical impulses are scanned, converted into algorithms and then into bioacoustic sound played through a surround sound system. Donnarumma will use the performance to present the output as an invisible, malleable sonic object sculpted and held in his hands. The gestures he makes in turn prompt new bioacoustic material, resulting in a dynamic portrayal of the body’s power to simultaneously stimulate and illustrate “the metaphor of an invisible and unknown object” (Donnarumma). Matthijs Munnik, a new media artist based in The Hague, will present “Heliosphere,” an installation shown at the CTM 2015 Exhibition, opening on the 23rd at the Kunstquartier Kunstraum. Munnik creates science-inspired installations and performances that challenge and experiment with the perceptions of the visitor and test the limits and complexities of this perception. His work has been featured at the TodaysArt and Sonic Acts festivals. “Heliosphere” is a installation set up in a small black room in which various colored light beams are projected onto a panel of slowly-falling fog. At the bottom of this curtain of fog, the liquidized vapor collects in a small pool, which in turn mirrors the light activity taking place further above. The scenario operates as the hallucination of a kind of second, simulated, heightened version of nature- a nature in which the technicolored obscurity prompts question about the boundaries of reality, body, and mind. On Sunday 25 January, Paul Régimbeau will provide an acerbic prelude to stoner metal legends Electric Wizard with his project Extreme Precautions. Over the past year, having had his fill of churning out albeit brutal techno, Regimeau began turning to grindcore masters such as Napalm Death, Brutal Truth, and Pig Destroyer for even rougher relief. He bases the project of his new moniker on a similar, if digital, sound. His new release as Extreme Precautions, / , will be put out on his own imprint, In Paradisum. The next SHAPE artist, Hungary’s Gábor Lázár, will add to a hard-as-nails roster (consisting of Prostitutes, Aleksi Perälä, Maelstrom and Egyptrixx) on January 30th at Berghain. Lazar plays algorithms, giving a voice to the screeching melodies of the CPU’s tortured soul. This is computer music at its purest, with an obvious devotion to the unique aesthetics of cold logic as a musical instrument. His first release was a collaboration with Russell Haswell on Last Foundation; his second, ILS, in 2014 on Lorenzo Senni’s Presto!? label; his third, EP16, also in the past year on The Death of Rave. On Saturday 31 January at HAU2, Milan-based artist Lorenzo Senni will extend his reconnaissance and abstraction of 1990s rave music from the exclusively aural to include the visual and tactile with his project “Advanced Abstract Trance (AAT).” Based on a 28-minute study in which he assembled and recombined samples of static, breakdowns, and restarts from trance, hardstyle and hard trance tracks, the project itself will draw exclusively from original sounds and be adapted for live multi-channel diffusion. Senni’s 2012 debut LP on Editions Mego, Quantum Jelly, and his 2014 mini-album on Boomkat Editions,Superimpositions, were lauded internationally for their “pointillistic trance” (in Senni’s words) and playful exploration of the emotional buildups and breakdowns of euphoric rave music. RSS B0YS, another SHAPE-supported project also presented in conjunction with Unsound Festival in Poland, will appear at YAAM on 31 January. RSS Boys is a shamanistic techno project combining analogue hardware with e-drums managed and performed (in veils) by two nameless Polish artists. Their latest release, NOOW, was delivered via cassette label Sangoplasmo, and the one before that, W DONT BLV N HYP, via Mik Musik. Ignited by a meeting in Africa and inspired by the transformative potential of the drum circle, the project celebrates the archaic roots of techno through exploring tribal musical traditions at once intricate and gut-level, provocative and hypnotizing. Yair Elazar Glotman, aka Ketev, will join RSS Boys and an array of Berlin Current artists in the same party on the 31st at YAAM. Glotman is a Berlin-based musician and sound artist whose work takes the form of experimental electroacoustic composition, sound installations, and sculptures. His post-techno aesthetic centers on the creation of phasing patterns from Reel-to-reel tape loops manipulated by 4-track cassette decks. These patterns are often placed above slowly shifting, rhythmic post-techno mantras. Ketev’s self-titled debut release on Opal tapes in 2014, described as “picking up where the darkest records by Andy Stott and Sam Kerridge left off” (Boomkat), was well-received and quickly followed by a second release,Singular Stare, on the UK label where to now?.